Here at Alderley Edge Golf Club, we have an extremely active and enthusiastic Junior Golf Academy. We are also always keen to encourage junior golfers, especially those that have never played before and not a member of the golf club, to come and take part in our broad programme. 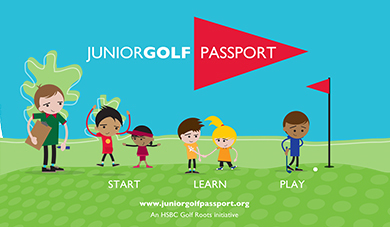 Juniors can take part in the Junior Golf Passport programme sponsored by HSBC, with coaching in areas as varied as technical skills, physical fitness and skills for life. Alderley Edge we believe that juniors need to start early, this will help them progress to the intermediate junior academy and give them skills they can carry through their lives. We have put together a structured programme for them to work through which carries an element of fun to help retain their membership and keep them focused on what they need to be doing in order to improve their game. The course will be run over 5 weeks. When each junior starts the programme they will be given their 'personal goal' setting pack which includes tips on how to improve their game and quizzes to improve their knowledge of golf. When a junior has completed each section they will receive a personalised ball marker as a token of their achievement. The cost of the programme is £45 per child with a maximum of 6 per group per session. Discounts available for siblings. The intermediate academy is for those who have progressed from the 5-9 Academy club and wish to further enhance their skills or for juniors who have some relative skill and knowledge of the game. This 8 week programme will be set out over 8 x 1 hour sessions with summer and spring hours spent out on the course learning skills and autumn and winter hours spent learning the technical aspects of the game in our state of the art indoor facility. As with the 5-9 academy all juniors will receive a 'personal goal' pack and on completion of each section they will receive a personalised ball marker as a token of their achievement and success. The sections for this age group will be more advanced than with the 5-9 academy as the intermediate juniors will have to start learning the rules and regulations of golf. We will regularly go over these throughout the duration of the course. Alderley Edge Golf Club continues to be a Golf Roots Centre recognising AEGC as a Junior friendly golf club where Juniors are welcomed. We are currently able to offer Free membership too Juniors under 15 years of age on joining.